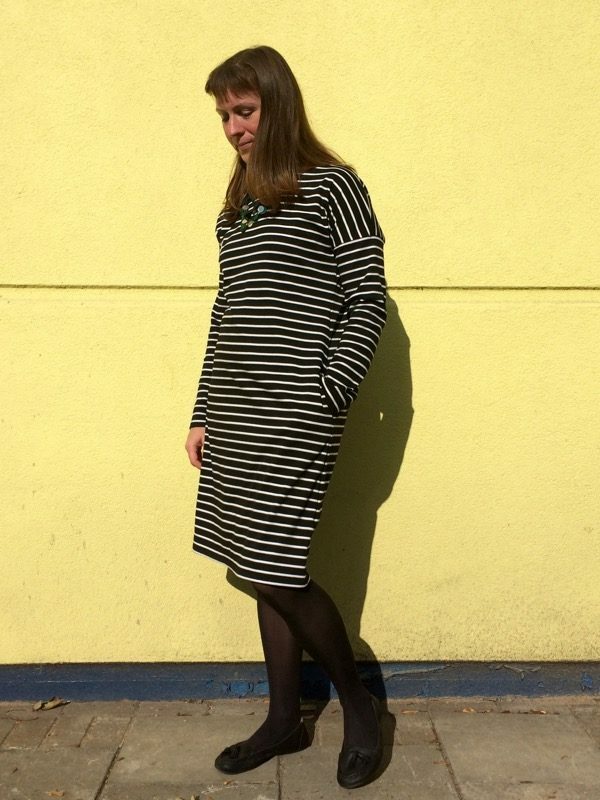 The origins of this dress are a bit "chicken and egg" - did I think about making the Breton tee dress from the latest Great British Sewing Bee book first, or did I decide I finally wanted to cut into the hefty black and white striped ponte in my stash first? I'm not entirely sure of the order, but I do like it when a plan comes together which doesn't involve me buying anything more! 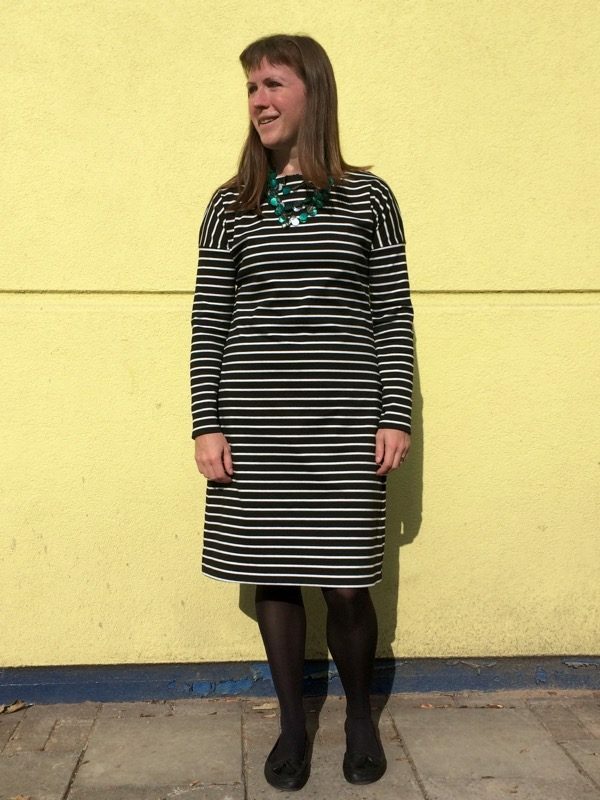 The origins of this dress are a bit “chicken and egg” – did I think about making the Breton tee dress from the latest Great British Sewing Bee book first, or did I decide I finally wanted to cut into the hefty black and white striped ponte in my stash first? I’m not entirely sure of the order, but I do like it when a plan comes together which doesn’t involve me buying anything more! You may recall that I’ve already (kinda) used this pattern before, when I managed to squeak a cropped, short sleeved version of this out of the remains of my neon orange pique jersey earlier this summer. But this time around I had plenty of fabric, so I went for the long sleeves AND dress length. I’ve actually made this pattern once before – I was tasked with sewing it for the book last winter when I was feeling really ill. Proof that I really can sew on autopilot sometimes, I took the fabric (a lovely French terry), sewed it to the specifications, posted it back, and then promptly forgot all about it. Until several months later, when I was flipping through the book and thought “oh, that fabric looks familar- OMG THAT’S BECAUSE YOU SEWED THAT DRESS, MELISSA!”. This time around I made the inseam pockets from a thinner jersey in my scraps bin as my Breton ponte was so thick. It makes for a great, beefy dress, but I was concerned that if I used it for the pockets it’d just get too lumpy. Other than the pockets, I sewed a straight size 12, taking care to baste my side and sleeve seams before overlocking to make sure the stripes lined up! 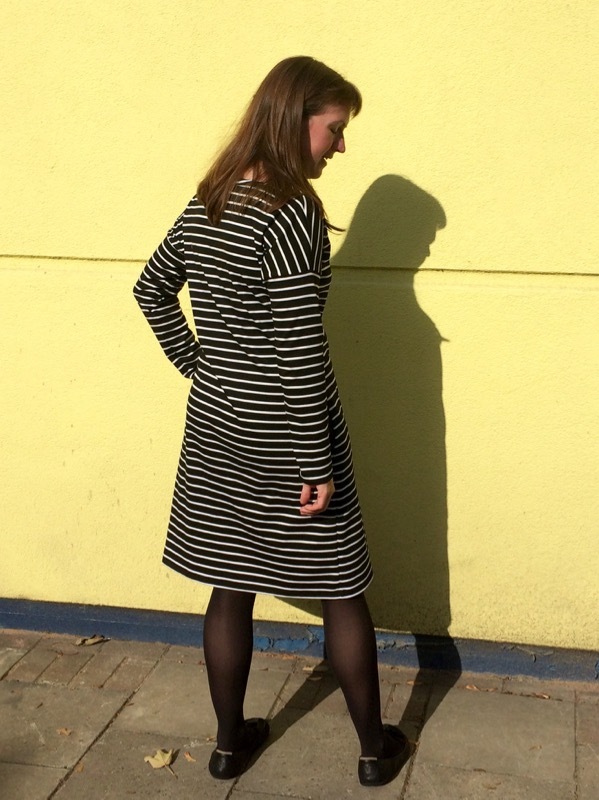 The finished dress is very comfortable, but it feels a touch oversized and sack-like. Not that there aren’t days where you fancy wearing a sack (and I’m sure there will be come winter! ), but I’m not sure if maybe raising the hemline might help, or carefully nipping in the side seams above the hips… I’m loathe to do anything that will disturb the stripe matching, to be honest, and I’m not entirely convinced it’s a problem as-is. Maybe I just wear too many fitted sheath dresses! 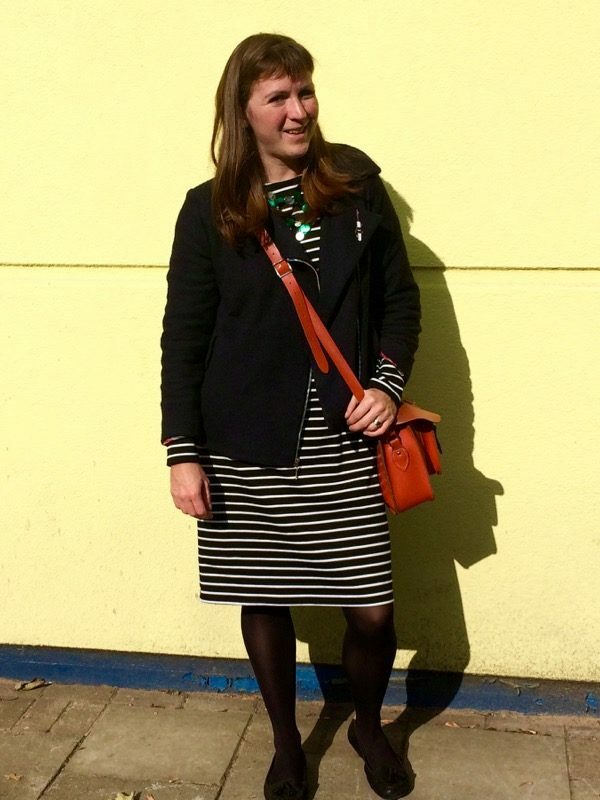 We took these photos on Saturday while we went to our local market and grocery shops, so I thought it was worth showing “how I wore it”, paired with my Named Harriet jacket (which I freaking adore!) and my trusty orange leather satchel (ditto). Anyone else sewing for comfort already now the weather has turned? 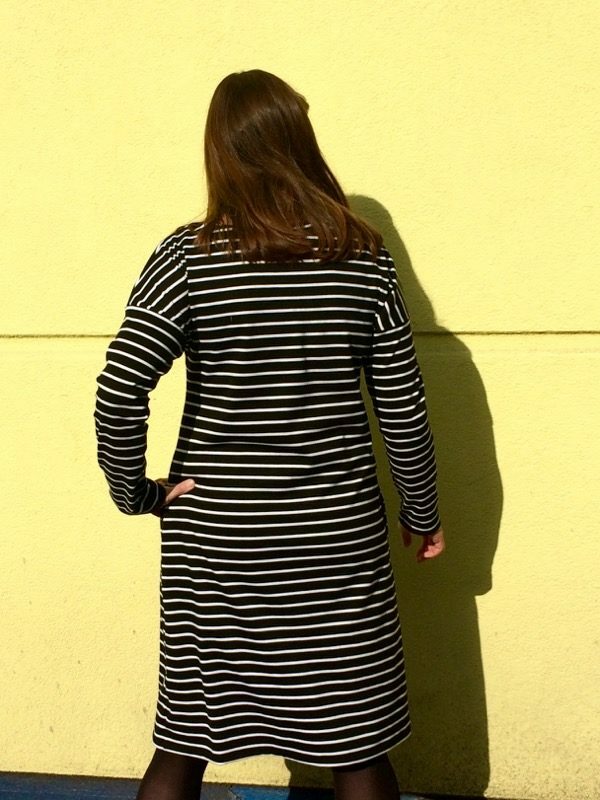 Separator image Posted in Gallery and tagged with dress, gbsb, knit. I love it, especially with the jacket. I will have to get this book. 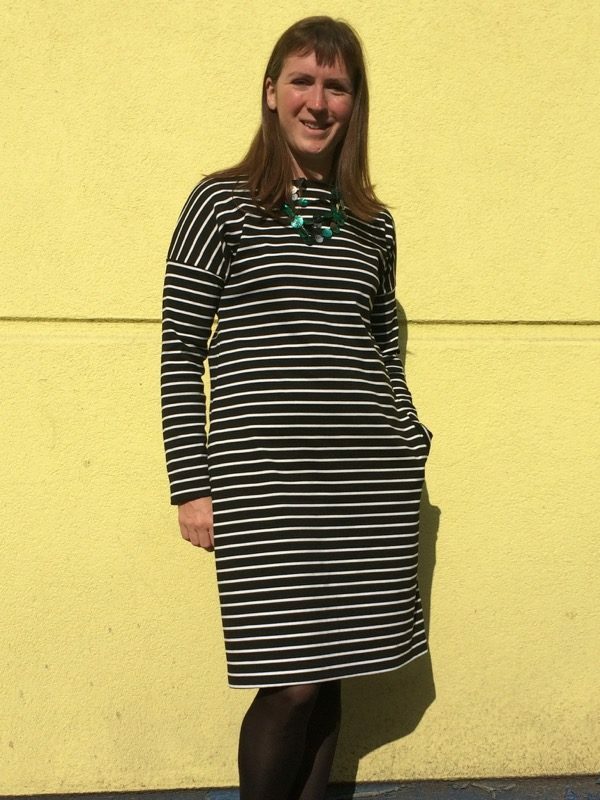 I already have the book, and the same (if not astonishingly similar) striped ponte fabric, however I am not a size 12. 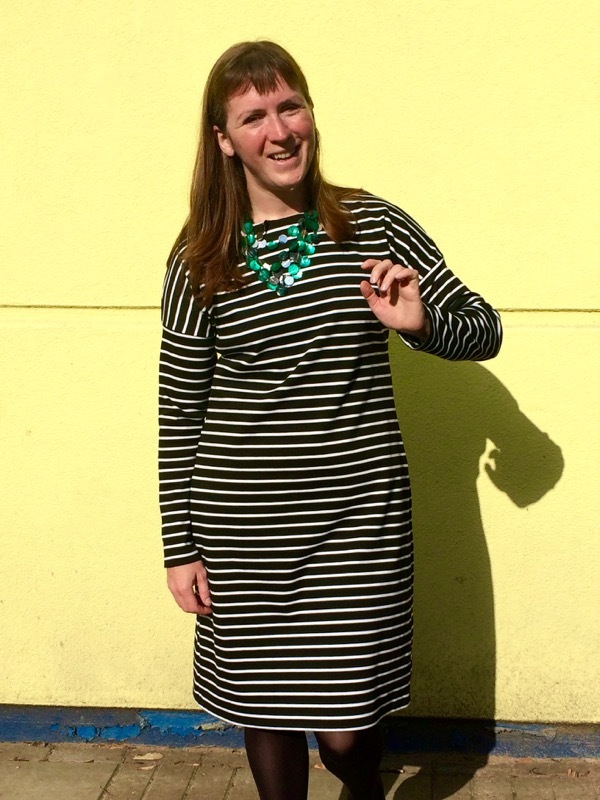 I may sew it in something slightly larger…..
would totally recommend it, it’s a super comfy dress! 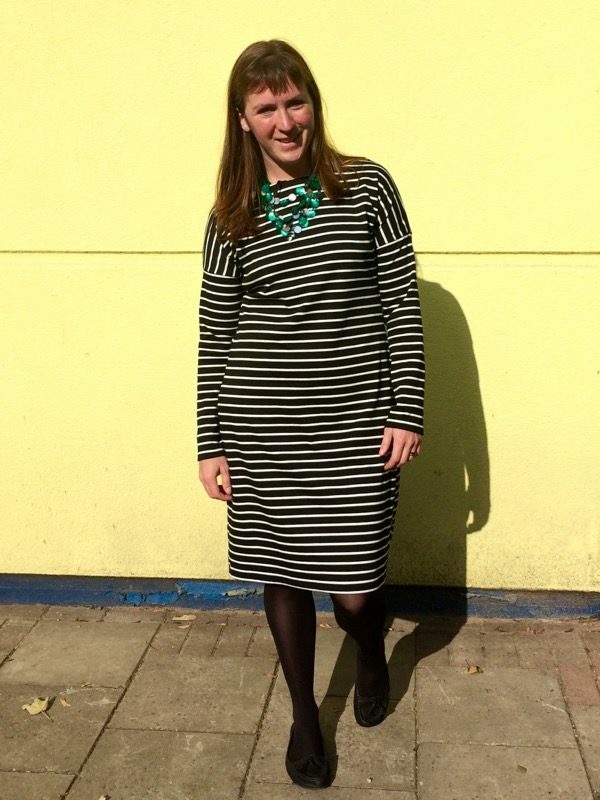 Would love to see your black & white dress worn with a (loosely slung) funky belt that works with the colours in your necklace, and finished off with black kneehigh boots. These dresses are so versatile because of how whatever accessories you use make into a completely different look. Cool dress. My initial thought was to raise the hemline, but the last photo changed my mind. Looking very chic as is! That’s funny. 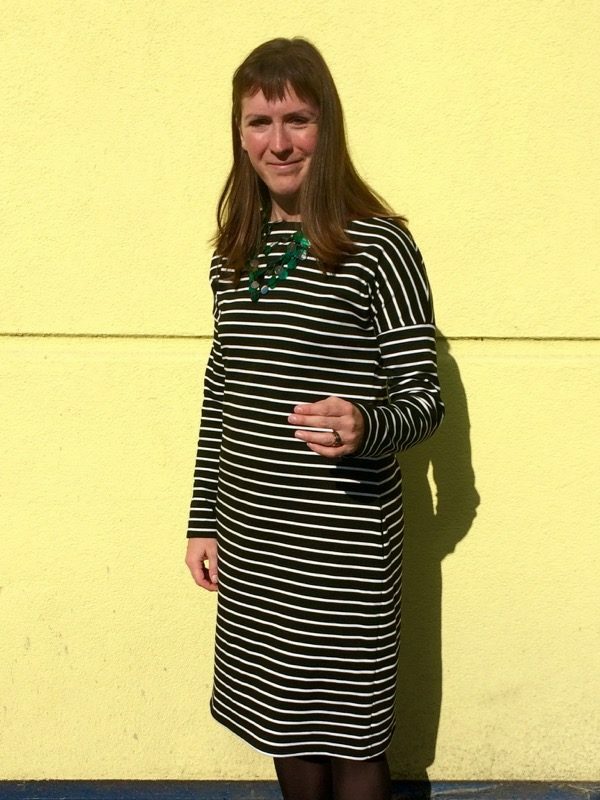 I just posted about a sack-shaped sweatshirt I made last weekend (and I don’t usually do shapes like that) and now I’m reading about your dress. Like skaapie, I initially wondered if it needed to be a bit shorter (or a bit just a tiny bit narrower all over) but completely changed my mind when I saw the last picture. That looks great the way it is. Effortlessly cool and chic. I’d say keep it this way, enjoy the sack shape on the days you want that and style it up on other occasions. I agree that your dress is a little oversized. Wouldn’t take much of a tweak to run it in a little. It is a cool look though.